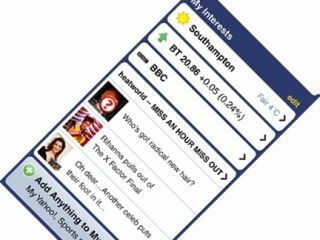 Yahoo has officially unveiled its Yahoo Mobile application for mobile web and iPhone for the UK market. Although Yahoo Mobile was announced at Mobile World Congress, it has now arrived for more than 300 models with 'HTML-enabled mobile browsers' and is also a made-to-measure iPhone application. Mobile web users can get functionality by visiting the http://new.m.yahoo.com web page. "Consumers around the globe are demanding compelling mobile internet services that offer increased personalisation, and allow them to easily manage all the content they care about in one place on their phones" said Mitch Lazar, MD of Yahoo Mobile in Europe. "To further capitalise on the market potential and continue our mobile leadership, we created Yahoo! Mobile, a dynamic starting point enabling consumers to discover the world around them, stay connected through a variety of communication services, and customise content to define their internet experience on mobile devices." The service wraps up Yahoo's mobile search, an instant messenger client, Yahoo mail and third-party applications. Early reviews on iPhone's App store are less than glowing, ranging from 'it's okay-ish' to 'not ready yet' with one user stating that it is 'slow over GPRS' and that there are 'too many oops! the page is not available' messages.